Daily Acts of Resistance: Filibuster or bust! Short version: If either of your Senators is a Democrat, call them today and urge them to filibuster Trump's Supreme Court nomination, Neil Gorsuch. Find your Senators' contact info here. Scroll to the end of this post for a script. Call all their numbers until you get through. Don't give up - it may take a while. If you haven't already done it, use this as an opportunity to complete your activism cheat sheet so you never have to look up their numbers again. This seat on the Supreme Court became vacant during Obama's reign but the Republicans repeatedly blocked his nomination, Merrick Garland, a well-respected, non-controversial choice, mounting a ten-month stonewall to avoid having so much as a committee hearing on Garland. Senate Republicans also threatened to keep their filibuster up for four years if Clinton had been elected. Now it's time for the Democrats to return the favor, immature as it may be, the alternative is too wimpy to be countenanced. 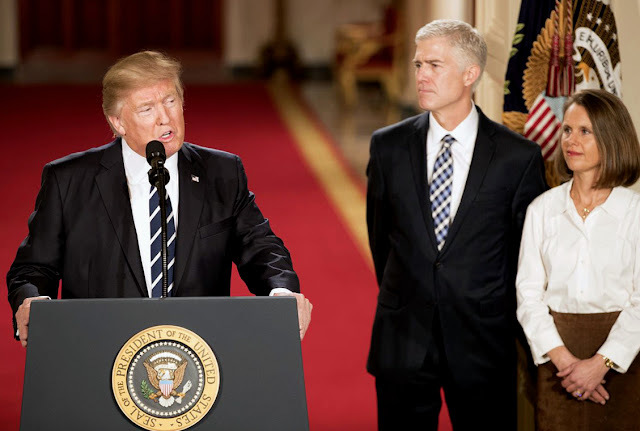 Legal experts predict that if he's confirmed, Gorsuch will be one of the most conservative modern justices to sit on the Court. As a justice on the 10th Circuit Court of Appeals, Neil Gorsuch repeatedly tried to gut the Affordable Care Act's birth control mandate and would have allowed Planned Parenthood to be de-funded. His record shows he's a threat to Roe v. Wade. Current Senate rules require a nominee to receive 60 votes, eight of which are held by the Democrats. We can't let this life-long position go to Gorsuch. Call your Democratic Senators today. Tweet at them, post to their Facebook pages, send them a printed letter, a fax, or all of the above. Hi, my name is YOURNAME and I'm calling from YOURTOWN/CITY. I don't need a response. I'm calling to beg the Senator to filibuster Trump's supreme court justice nominee, Neil Gorsuch. Gorsuch is extremely conservative and poses a serious threat to the sanctity of Roe v. Wade and other women's rights and civil rights issues. In addition, you need to show the Republicans that you will not simply roll over after they stole this seat from Merrick Garland by throwing a 10-month tantrum last year.. Please tell the Senator to show some spine - America's future is at stake. Thank you so much for taking the time to pass on my comments.